For any company, years of success and growth are, of course, a good thing. But with scale, organizations can experience growing pains. Such was the case with Emma, Inc., an email marketing company that has been in business since 2003. Despite certain elements of the company being quite streamlined and efficient, the management of vendor contracts was lacking transparency – and so purchasing had taken on a life of its own. Everyone, it seemed, was doing their own thing. Emma was not a stranger to process change and technology as a solution to doing business faster. The company had already streamlined many systems, using industry-standard tools like Salesforce CRM and CPQ for clean, automated management of their constituent databases and sales/quote processes. But when it came to reining in disconnected, decentralized purchasing, Emma was having trouble figuring out how to go about solving the problem. The idea of getting stacks of disparate vendor contracts into one single place that everyone could login and know what everyone else was doing, seemed sort of like a technological pipe dream. But the technology was out there, as Emma discovered thanks to its new Vice President of Operations, Karen Hodson. That technology was SpringCM. When Hodson arrived on the scene at Emma, she brought a fresh set of eyes to operations – and she noticed that the scattered state of their vendor contracts had grown to a serious money sink in a few different ways. The first and more obvious way was that people in purchasing were doubling or tripling purchases of similar supplies and resources. The costs of this redundancy had long since begun to add up. And it's easy to see how impossible-to-track vendor relationships could lead to such a state of affairs. If nobody knows what anyone else has or needs, employees will sign on the dotted line to get what they need, not realizing that the same product is coming in the door for a department on another floor. And Hodson also noticed that, while Emma's purchasing process was inefficient on a macro level, it was also causing losses in subtler, smaller ways. Contracts were sent around via email and so were sometimes lost or hard to track down. Signatures were managed by hand and sometimes required chasing people to get things signed. There was plenty of room for process improvement both in determining who did the purchasing for what, and how they got the job done. And this required not just transparency between purchasers, but that Hodson, in a high-level operational role, had full transparency into what was going on. Hodson found that for the whole business and for each employee, SpringCM was the solution that could solve these problems. SpringCM's promise of a single, cloud-based comprehensive repository where all vendor contracts would appear was, of course, a prime driver for Emma to adopt SpringCM. But there were benefits even beyond transparency. SpringCM could easily work in conjunction with the other next-gen tools the company had integrated. Since the company was already using Salesforce to meet many of its operational and sales needs, it seemed obvious that they would want their vendor contracts repository to be readily available for use in Salesforce. All the other contract management options Emma looked at seemed to require manual workarounds, or an expensive custom-built API, to offer this functionality. 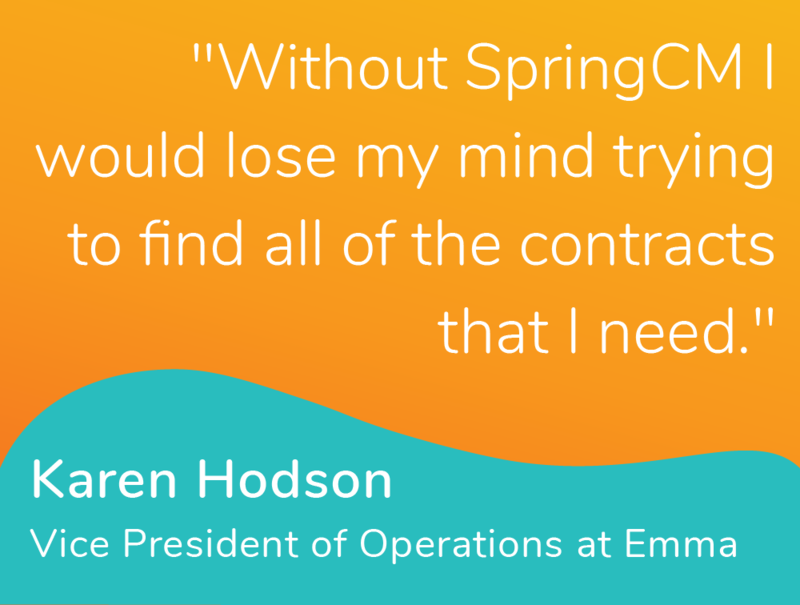 But with SpringCM, Emma could manage vendor contracts in the repository through Salesforce as necessary with no extra work. And at the same time, everyone would have convenient access to the repository, and could manage tasks like routing and signing through automated processes. Since SpringCM's rollout at Emma, the purchasing process has gotten under control and the ROI is already showing. Purchasing is being done with strategy behind it, and that’s something Hodson truly appreciates. And using SpringCM's automated workflows, digital signing tools, renewal monitoring, document audit trails and the like, each individual relationship is being managed better. Hodson is not the only one who has been able to work more easily and effectively thanks to SpringCM. The employees involved in managing vendor contracts and doing the purchasing are also thrilled about the time SpringCM has been saving them. In fact, the company is seeing such value that they're planning on implementing SpringCM for the sales side of their contracting needs.